Britain ruled India not for nothing. They exploited the abundant natural resources as well its simple folks. They earned huge profits by exporting tea, opium and cotton to Europe. They employed the Indians like Africans as labors in many of their colonies overseas where there was a shortage of labor for cultivation. Opium obtained from poppies grown in the fertile valley of Ganges in Bihar was considered of high quality because of its high alkaloid morphine. It was traditionally grown in this region since the times of Mughals who were heavy users of it and many of their princes are known to become addicts. 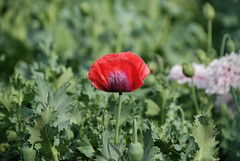 Opium poppies yield valuable alkaloids used as medicines. Medicines produced from opium poppies include morphine and codeine. Its cultivation and production is strictly controlled because opium poppies are also used to make illegal and highly addictive drugs such as heroin. It has many names such as Opium poppy, common poppy, garden poppy, chessbolls in English, Kas-kas, kashkash, aphim, afim, afyun in Hindi, Ahiphenam, aphukam, ahifen, chosa, khasa in Sanskrit, Posto in Bengal, Aphina, khuskhus, posta in Gujarat, Abini, gashagasha, kasakasa in Tamil. Its botanical name is Papaver somniferumFamily: Papaveraceae, the poppy family. The plant has flowers with papery petals that can vary in colour from white to red or lilac with a darker purple base. Fruits – a rounded capsule topped with the disc-like stigma remains. The liquid that is obtained from the fruit capsule by making cuts with a knife contains morphine alkaloids which are dried to produce raw opium. Opium is used to manufacture medicinal drugs like codeine and morphine, and for illegal drugs such as heroin. Seeds – small and black, dark blue or yellow-white. The seeds are edible and tasty and are used in bakery products such as poppy-seeded bread. Opium flourished in the Arab world, as in Islam opiates were not prohibited in the same way as alcohol. In the 7th century, the Islamic cultures of western Asia had discovered that the most powerful narcotic and medicinal effects could be obtained by igniting and smoking the poppy’s congealed juices. The history of opium poppy use is relatively recent in South Asia. Arab trade and the expanding world of Islam are assumed to have introduced knowledge of the opium drug to the Indian subcontinent by the 12th century. The first records of its cultivation appear in the 15th century and refer to Malwa as a centre of production. The Sanskrit words ahiphena and the Hindi afin are derived from the Arabic word ofyun to denote opium. The advent of the Europeans had a significant impact on the future of the opium poppy in India. The Dutch now introduced smoking opium in a tobacco pipe to the Chinese. As the decline of the Mughals began, the State lost its hold on the monopoly and the production and sale of opium was controlled by merchants in Patna. In 1757, the British East India Company which had by that time assumed the responsibility for the collection of revenues in Bengal and Bihar, took over this monopoly. In 1773 the Governor-General, Warren Hastings, brought the whole of the opium trade under the control of the Government. In the late 18th century the British East India Company was expanding its sphere of influence in India. East India Company began sending large quantities of opium to China through Hongkong. The profits were very high. The Chinese had become addicted to opium consumption and country began to weaken both in terms of moral and economics. The Imperial court tried to ban the use and import, but British would not heed. Also they were not directly in the picture. It was the ships owned by rich Indians which carried out this trade. They reached near Chinese shores and moored in the sea and speed boats owned by smugglers unloaded the opium for taking illegally to the shores. The poppy growing was mostly confined to three centres: Patna Opium from Bihar, Benaras Opium from Uttar Pradesh and Malwa Opium from central India. The Chinese authorities attempted to suppress the smuggling of opium which was debilitating the country and reversing its formerly favourable balance of trade. Their confiscation and destruction of illegal opium sparked the First Opium War in 1839. British warships defeated the Chinese who signed the Treaty of Nanking paying a huge indemnity and ceding Hong Kong to the British. A second Opium War was fought in 1856 when the French and British combined to bring the Chinese to heel and opium import in China was thus legalised. Not until 1910 did the opium trade between China and India cease. 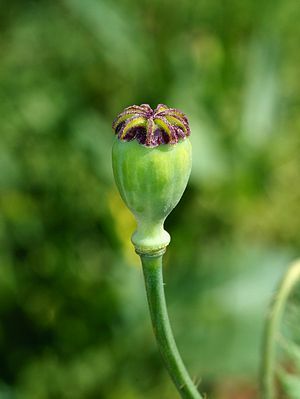 The unripe seed pods of the opium poppy contain a group of alkaloids known as opiates that are often used as sedatives. The alkaloids can reduce pain, alter mood and behaviour, and induce sleep or stupor. It is a narcotic and potentially highly addictive. In traditional medicine opium was made from the air-dried milky latex or juice from the unripe seeds from poppies. The quality of opium would vary depending on whether black or white seeds were used. Opium from India contained not only high levels of the alkaloid morphine but also the alkaloid codeine. This could explain why it was traditionally used to relieve pain and to suppress coughs. The presence of another alkaloid called papaverine in the seeds could explain why the extracts relaxed muscles and reduced stomach and respiratory spasms. The seeds were also used in Ayurveda and Siddha medicine. They were cooked and ground with sugar and cardamom seeds and used to treat diarrhoea, coughs and asthma. Extracts of poppies were used to treat fevers, tuberculosis, liver and kidney problems as well as diseases of the urinary tract. Unlike the unripe seed capsules of opium poppies, the ripe seeds do not contain narcotic chemicals. They are used in many forms of cooking. The seeds can be cooked in water with oil and salt and served with rice where they provide a nutty flavour. They are also blended with tamarind into a curry paste. In confectionery they are sprinkled on sweets and are added to baked goods like breads and cakes.